Hi, let me introduce you to a tool I'm working on for quite a while now. 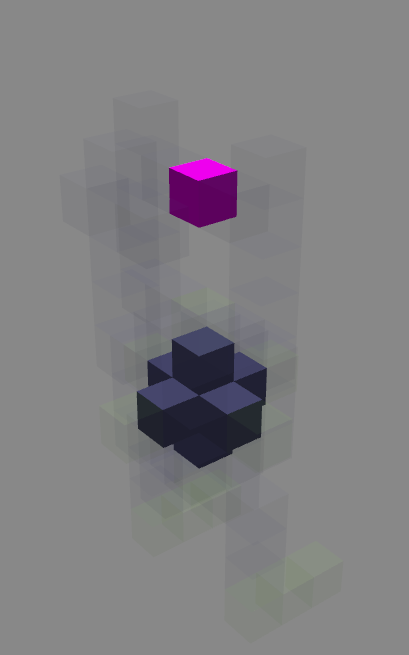 It's a HTML5 WebApp for viewing and editing voxel models with some extra Trove specific features. It should run in every browser with WebGL support (tested with the latest versions of Chrome, Firefox, Safari and IE) and it's still in an early development phase (it should run quite stable now, but some features are still missing). If you want to view Trove's voxel models in Troxel you have to convert the .blueprint files into .qb files first using Trove's devtool and then you can simply drag all 4 material maps in Troxel's open dialog to open the voxel model. @devs: Would creating a list of all items from Trove with the ability to view them as readonly 3d models be allowed? Feel free to leave your feedback or suggestions here and report any issues/bugs you might find. .... Dude.... I have no words. This is just amazing. I just freaked out and showed the entire team. This blows my mind. 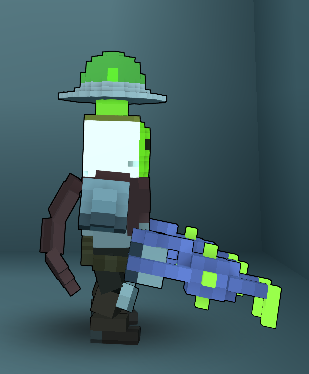 I'm going to share this with our mods on Trove Creations and the Creations reddit. This is just surprising and humbling to see something so powerful made around so much of our work. I'm going to shove this in the face of everyone I possibly can. Good stuff. You did a great job putting this together. Seconded, this is quite amazing! One thing that may be useful for some folks would be a dropdown from where you can set the editing volume to preset values based on the things we are currently accepting as submissions - so you can choose 'decor' and it creates a 12x12x12 volume you can create your prop in, or choose 'melee' and the volume is set to 10x10x35, etc. Not strictly necessary, but might be a 'nice to have' feature. Very nice, but I noticed that there seems to be a problem with Alpha maps, a gun I am working on with no transparency showed up almost entirely transparent except for some center blocks (likely ones I didn't make white on the alpha map). Also, I'd prefer the material maps be arranged alphabetically (A, S, T) so that it's easier to simply go down an alphabetical list to get the maps I want. I did not play around with it too much but it seemed sluggish. I suspect this is the nature of HTML5? Will it support exporting with all the data needed to set the masks er transparencies and points where avatar's hand is placed and all the data Trion Devs need to just pop it in or for us to pop it in? I ask because I don't think Zoxel has this and you manually have to create 5 or 4 different versions? Wow, this easily trumps any existing editor for making Trove-specific models. Try clicking the Export model as... button. It already exports up to 4 .qb files if you need the additional maps. The attachment point for equipment is simply a #FF00FF voxel in the main file, no special feature needed. The only thing you need to do outside Troxel is to use the devtool to mix down to one .blueprint for previewing in-game and submission. And no existing voxel editor has support for Trove's 1+3 file "format". It's basically like hacking together a layered image format using multiple jpg's. Thanks for the feedback :-) Im currently working on getting the Trove itemlist in and some other bugfixing. Very nice, but I noticed that there seems to be a problem with Alpha maps, a gun I am working on with no transparency showed up almost entirely transparent except for some center blocks (likely ones I didn't make white on the alpha map). The funny thing is, that a recently changed the transparency behavior all the way around, because I thought I was fixing a bug. In fact the devtool is exporting all solid blocks as 101010 instead of as FFFFFF. I will revert this behavior and keep a copy of the current one for the Trove item importer until the devtool gets fixed. Also, I'd prefer the material maps be arranged alphabetically (A, S, T) so that it's easier to simply go down an alphabetical list to get the maps I want. You can just drag on drop all 4 files at once into the open dialog instead of selecting each one separate with the file input . Which browser did you use? I would highly recommend Chrome or Firefox. Are these other WebGL examples running fine for you? On the other hand I must admit, that there is still a lot of optimization missing: Everything runs in the same thread as the GUI (so any file operation will block the UI). It is planned for the near future to move some work into WebWorkers (we have a hard dependency on WebGL so we don't have to care about to old browser), which are running in different threads. On other problem is that using the rotate or mirror functions multiple times within a short interval could result in memory leaks, because this code is not optimized for the garbage collector yet. You can pan the model with the arrow keys atm. More keyboard shortcuts will be added at some time. The color picker + palette should be a feature, which your browser should offer to you. It depends of your browsers implementation of <input type="color>, but at least a colour picker should be shown after clicking on a color input.